Guests of Disney hotels using Disney's Magical Express service can check their bags at their hometown airport, bypass baggage claim at Orlando International Airport and board state-of-the-art motor coaches to the Walt Disney World Resort -- as their bags "magically" appear in their room upon check in. The round-trip service is designed to give Disney hotel guests the stress-free vacation they want. The complimentary round-trip airport shuttle/baggage delivery service will be available for guests booking vacations that include overnight accommodations at 28 Disney hotels*. With Disney's Magical Express service, a family of four can save more than $90 (based on round trip shuttle or taxi transportation, plus tip, for two adults and two children). * Disney's Magical Express service is not be available to guests of the Walt Disney World Swan and Dolphin hotels, the Shades of Green and the seven hotels near Hotel Plaza Boulevard. How Disney's Magical Express service works? · Disney's Magical Express must be booked at least 10 days prior to arrival and can be booked when completing your initial resort room only or package reservation. If you decide to book after your have made your reservations, you can do so by calling 866-599-0951 or by calling 407-939-1936 or a travel agent. · Guests check their specially-tagged luggage at their departure airport. · Upon arrival in Orlando, guests arriving between 5:00AM and 10:00PM may bypass airport baggage claim and go directly to the Disney Airport Welcome Center located on the B side of the airport terminal. For airport arrivals after 10:00PM, guests may collect their luggage at baggage claim and transport it with them on the motorcoach. International guests must follow the U.S. Customs and Border Protection process and claim luggage after disembarking the plane and then proceed to Terminal B. · Be sure to have your Magic Band with you and ready to be scanned by the staff at the Disney Airport Welcome Center. Doing so allows you to proceed directly to the bus line for your designated resort without having to stop at the Welcome Center desk. · Guests board state-of-the-art motor coaches that take them to their Disney hotel. Disney's Magical Express service makes guests' return to Orlando International Airport hassle-free as well. This convenient system lets guests flying with participating airlines avoid airport check-in lines by enabling passengers on domestic flights to check their luggage and receive a boarding pass before ever departing their Disney hotel. As an added benefit, guests with flight departures later in the day no longer have to worry about their luggage after they check out of their hotel. They can simply check their luggage at the Resort Airline Check-in Desk and then enjoy the last day of their stay. Participating airlines include AirTran, Alaska, American, Delta, JetBlue, Southwest, United Airlines, and US Airways. Guests unable to use remote check-in may store their bags at the resort luggage room until departure. 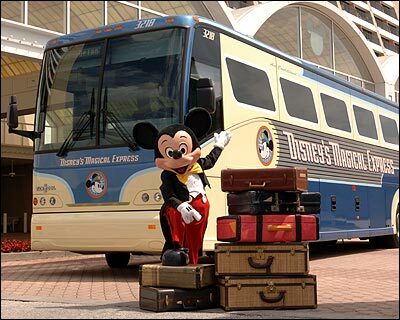 Disney’s Magical Express is a complimentary service to Walt Disney World Resort Guests. What if a guest doesn’t want the service? Is there a credit? If a guest elects not to utilize the service, they will not receive a “credit” to their reservation. All Walt Disney World Resort hotels other than the Walt Disney World Swan and Dolphin hotel, the hotels on or near Hotel Plaza Boulevard and Shades of Green. The Disney Vacation Club Resorts at Vero Beach and Hilton Head are also excluded. If a Guest moves to an off-property resort, they are on their own for transportation back to the airport. Can a Guest book a one-way airport transfer (to or from)? Can a Guest book return transportation to the airport while on property? Yes; guests can book return transportation to the airport by calling Disney’s Magical Express Guest Service. The Resort Front Desks will have a communication card with the phone number to hand to the Guest. Can a Guest book a “luggage only” transfer? Can a Guest book transportation upon arrival at the airport? No. Guests must book Disney’s Magical Express service reservation at least 10 days prior to arrival, so that they fully benefit from the service and a seamless luggage delivery to their Resort room. What is the cutoff date for booking Disney’s Magical Express? Disney’s Magical Express must be booked within 10 days of arrival. How does Disney know which bags to transport? Before leaving home, you will receive special luggage tags to put on each of your checked bags. These luggage tags will identify which bags Disney will transport to your resort. What if the Guest doesn’t receive the special luggage tags? If a Guest doesn’t receive the special luggage tags, they should speak with the Cast Member at the Disney Magical Express Welcome Center at Orlando Airport. That person will take the Guest’s checked bags claim numbers to facilitate the transfer of the luggage for the Guest. Is the luggage pulled prior to Resort check-out? No. However, the Guest may request Bell Services’ assistance with their luggage to the motor coach area, but it is not transferred separately as it is on the inbound service unless the Guest is flying on a participating airplane and has used the Resort Airline Luggage Checkin system. Otherwise, the luggage will travel with the Guest on the motor coach and the Guest will check their luggage at the airline counter upon arrival at the airport. How many stops will the motor coach make between Orlando International Airport and the guest’s Disney Resort hotel? Anywhere from three to four stops to drop off guests at various Disney resort hotels. Will the motor coaches accommodate wheelchairs? Will Disney’s Magical Express provide wheelchairs at the airport upon arrival? How does return transportation to the airport work? Complimentary transportation from the Disney Resort to the Orlando International Airport is available to all Disney Resort Guests. A secondary benefit of the return trip to the Orlando International Airport – Resort Airline Check-In – offers remote check-in for select Guests, allowing them to check their luggage and receive their airline boarding passes at their Disney Resort. At this time, this remote check-in service is only available for Guests flying domestically on the following airlines: AirTran, Alaska, American, Delta, JetBlue, Southwest, United and USAirways. With this service, Guests with late flight departures no longer have to worry about their luggage after they check-out of their Resort; they can simply check their luggage at the Resort Airline Check-in Desk and then enjoy their last day of their stay. How will Guests know what time the motor coach leaves from their Resort to the airport? The Guest will receive a departure notice the day prior to check-out advising of the motor coach pick-up time based on the provided flight information. The general rule of thumb is 3 hours prior to the flight departure. Be sure to keep this document handy as you will need it to board the motor coach. Where are the Resort Airline Check-in Desks located? Are gratuities included for the luggage delivery to the Resort room by Bell Services? Yes, but for the inbound service only. Gratuities are not included if the Guest elects to utilize Bell Services for assistance with their luggage from their room to the motor coach pick-up area upon departure. 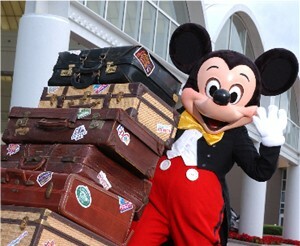 Is the Resort Airline Check-in service operated by Walt Disney World? No. It is operated by a Transportation Safety Administration -approved third party company on behalf of the participating airlines. When is the earliest a Guest using the remote check-in can check-in for their airline? 12 hours prior to their flight departure time. When is the latest a Guest using the remote check-in can check-in for their airline? 3 hours prior to their flight departure time. What does the Guest need to provide at the time of the airline check-in? Government issued ID (e.g. driver’s license, passport) and their Key to the World card to verify that they are a Walt Disney World Resort Guest. Will you continue to operate the Auto Car Care Center on Disney property that allows Guests to pick up a rental car? Is Disney’s Magical Express only available to Guests who’ve purchased air through the Walt Disney Travel Company? Or only to Guests traveling on a package? No. Disney’s Magical Express is a service available to all guests staying at a Disney Resort, irrespective of whether they have purchased a package or booked air through the Walt Disney Travel Company, directly with the airline, or through another channel. What service will guests on a Disney Cruise Line 7-day land and sea vacation receive? Disney Cruise Line Guests that purchase a 7-night land and sea package including ground transfers from Orlando International Airport will utilize Disney's Magical Express. Does the Guest have to utilize Disney’s Magical Express return transportation service back to Orlando International Airport to participate in the Resort Airline Check-in? No. This service is available to Disney Resort Guests on outbound flights with domestic service provided by AirTran, Alaska, American, Delta, JetBlue, Southwest, United Airlines, and USAirways. They can take advantage of the motor coach transportation back to Orlando International Airport or arrange their own transportation. What about carry-ons? What are they going to do with those? Will there be room on the bus or will they be stowed underneath? Carry-ons stay with the Guest. Either inside the motor coach or stowed underneath depending on the size. Is there a limit to the number of bags a guest can check at their resort versus checking in directly at the airport? The Resort Airline Check-in Desk will follow the same guidelines as the participating airlines. What about young kids? If I check a car seat, will I have to retrieve from baggage claim? Or is there another recommendation? Because of a Department of Transportation regulations, children are not allowed to be seated in a car seat on the motor coach. Therefore, if a guest carries on a car seat it will be stowed underneath the motor coach. Will the buses be resort-specific? Buses are not resort specific, but they will likely only stop at two or three resorts. Absolute maximum stops (very infrequent) will be four resorts in the same resort area. What if the Guest misses their flight? Where will their luggage go? If a Guest checks their luggage from their city of origin in time to make their originally scheduled flight, their bags are likely to make it to Orlando International Airport as scheduled, even if they miss their flight. Disney representatives will pull their bags and wait for the Guest’s arrival before forwarding them to their resort hotel. How long will it take to get to my resort from the airport? While it may be faster, count on approximately 1-1/2 hours to arrive at your resort after your arrival at the airport.